America wants crossovers, and not just any crossovers. We prefer our vehicles to look “rugged” even if they totally aren’t. 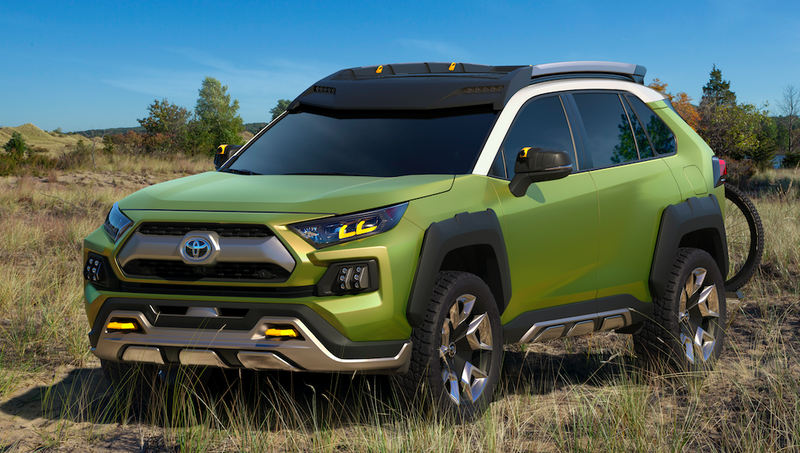 That’s probably why today at the Los Angeles Auto Show, Toyota showed off its “Future Toyota Adventure Concept,” filling the press release with “tough guy” terminology. It seems like these days crossovers are trying to make up for their intrinsically boring, aero-tuned shapes with odd headlights, fun paint colors, and two-tone tops (admittedly, this also applies to other segments). Body cladding also seems to still be in style. On those fronts, the new “Future Toyota Adventure Concept” is pulling out all the stops. Just look at those Nissan Juke/Jeep Cherokee/Citroen Cactus-style lights up front, the white top, and those chunky fender flares. FT-AC is perfect for those outdoor enthusiasts who want to dial up the adventure on their weekend getaways...No matter the roads, the activities, or the people, FT-AC sparks authentic fun and conversation. It’s just a design experiment, but Toyota says this FT-AC could offer torque-vectoring all-wheel drive and a hybrid powertrain. Let’s be honest, though, more so than actual capability, it’s really the “image” that you and your suburban family of accountants so desperately want. And what’s better for that than a vehicle that Toyota says is “experience-centric”? I don’t really know what that means, but damn if it doesn’t sound tough as nails.